Image courtesy of El Espectador. The state of racialized poverty and “abandonment” is stunning in Chocó, where over 90% of the over 1.31 million inhabitants are Afro-Colombian, many descendants of enslaved Africans taken captive to work the region’s famous gold mines beginning in the eighteenth century. While 65.9% of Chocoanos today live below the poverty line (and 37.1% in extreme poverty)—the highest rate in Colombia—the below-poverty level is only about 10% in the nation’s capital of Bogotá. As of 2014, about 81% of Chocoanos do not have their basic needs (such as potable water) met, in comparison to the national average of 37%. An astounding 42% of children born in Chocó die before their first birthday, double the average infant mortality rate in Colombia. Infrastructure in Chocó is largely nonexistent, with a crumbling, nearly bankrupt hospital in the capital of Quibdó, eleven municipalities that don’t have access to electricity, and the absence of roads connecting the capital to the major cities of Pereira and Medellín in the Colombian interior. And despite the recently passed peace agreement between FARC (Revolutionary Armed Forces of Colombia) guerrillas and the Colombian government in November 2016, Chocoanos still face death threats, assassinations, and violent displacement at the hands of armed rightwing paramilitaries that control the region. Yet, little discussed is that the May 2017 strike is actually the eighth official strike in the history of Chocó. In fact, this recent strike was a direct response to the government’s failures to fulfill their financial and social agreements that were reached after the last civic strike just a few months prior in August 2016. Back in August, the government, for example, promised to provide 720 billion pesos for the construction of two major roads, which have yet to be seen. Moving back in time, the first civic strike in Chocó’s history actually occurred in 1954, a few years after the department was established in 1947 under contentious political circumstances. As Colombian historian Juan Fernando Hernández Maldonado documents, prior to the creation of the department in 1947, Chocó was an “intendancy.” This meant that Chocó did not have the same level of governmental autonomy as a “department” and that the most important decisions were made by non-(Black) authorities outside of Chocó. But in the 1930s and 40s, a new class of Black intellectuals and political activists began to push for Chocó’s departmentalization—in some ways, akin to processes of self-determination throughout the world during this period—and challenge the local white elite class, many of them descendants of the former slaveholding class of the nineteenth century, based in the capital of Quibdó who controlled the region’s most important posts. Among this new class of Afro-Chocoano activists was Diego Luis Córdoba, a revered lawyer who was born in the small rural village of Negua in 1907 and defended working class and rural Chocoanos. A leader of the Grupo de Acción Chocoano, Córdoba was also an avowed socialist who famously claimed that “while there are workers and bosses, landholders and renters, real tillers of the land and latifundistas and absentee owners, the only adequate political position of the workers and campesinos is a socialist one.” Córdoba and fellow members of the regional political party Acción Democrática fought for the departmentalization of Chocó in the 1940s, which they eventually won in 1947. Given the racial dynamics of the political units (intendancies vs. departments), the history behind the making of the department of Chocó is central to modern Afro-Colombian history. Interestingly, the first strike in 1954 erupted over the proposed disintegration of the department itself. At the time, Colombia was controlled by the dictator Gustavo Rojas Pinilla, who sought to partition Chocó into three parts that would be integrated into the neighboring departments of Valle del Cauca, Caldas, and Antioquia, thereby dissolving Chocó entirely. When news of the proposed division arrived in Chocó, a committee organized a strike and demonstrations that lasted several days. In the end, the Pinilla dictatorship decided to drop the plan entirely. 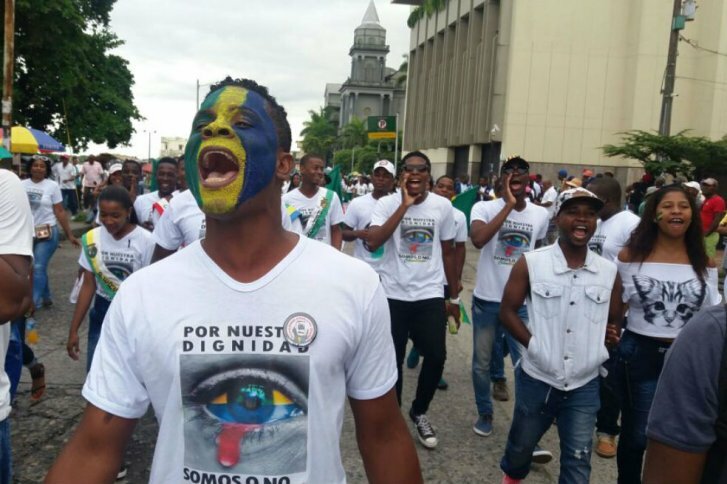 “We aren’t ‘in love’ with strikes, it’s that we need them,” claimed Dilion Martínez, one of the Afro-Chocoana women leaders of the most recent civic strike in May 2017. Indeed, Martínez and many others like her are carrying forward a long, necessary legacy of civil rights protest in Chocó and the Colombian Pacific—and ultimately the global #BlackLivesMatter movement. Yesenia Barragan is a historian of race, slavery, and emancipation in Colombia, Afro-Latin America, and the Atlantic and Pacific worlds. She received her Ph.D. in Latin American and Caribbean History from Columbia University. She is currently a Postdoctoral Fellow in the Society of Fellows at Dartmouth College. Her forthcoming book, Frontiers of Freedom: Slavery and Emancipation on the Colombian Pacific, explores the gradual abolition of slavery on the Pacific coast of Colombia, once the gold mining center of the Spanish Empire. Follow her on Twitter @Y__Barragan. Thanks for sharing a very interesting article! Knew absolutely nothing about Chocó before now. Hopefully things will improve for the better in the very near future.